Patrick Scott was one of many prospectors who spent a good part of their lives searching for mineral riches in the Huachuca Mountains. Scott eventually filed a claim called The Wisconsin in an area drained by the headwaters of Ramsey Canyon. For that reason, we know the two main tributaries of that major Huachuca Mountains drainage as Pat Scott and Wisconsin canyons. The Pat Scott Trail leads up the larger of these, which many consider to be an extension of the main canyon; the streamside habitat it supports is just as lush and nearly as full of bird life as in Ramsey Canyon. The hiking is just as pleasant, too. Habitats do change with elevation, however, and you'll get a chance to observe that change as you continue climbing from the Hamburg #122/Pat Scott trail junction. The canyon becomes steeper and more narrow as it climbs, and riparian plants give way to species we associate more readily with highlands than streambeds. In the upper reaches of Pat Scott Canyon, you'll also get a chance to observe the extensive damage that can result if mountain slopes are stripped of vegetation. A fire that removed many of the trees and much of the understory from this area in 1983 was followed by a flash flood that roared down the canyon like a bulldozer. That torrent increased the depth of the streambed as much as eight feet in some places and stripped the banks of trees and shrubs. Considerable damage was done to trail crossings, too, but those have since been repaired. As the trail nears the head of the canyon, it leaves the canyon floor and switchbacks its way up a steep slope to Pat Scott Saddle. Here, it joins with the Crest Trail #103. At this point, you'll find good views of Ramsey Peak with its wedding cake layered cliffs and of Ramsey Canyon dropping off toward the San Pedro Valley. If you still have the energy, the Crest Trail offers a number of optional routes to extend your hike. Best access to this trail is via the Hamburg Trail. 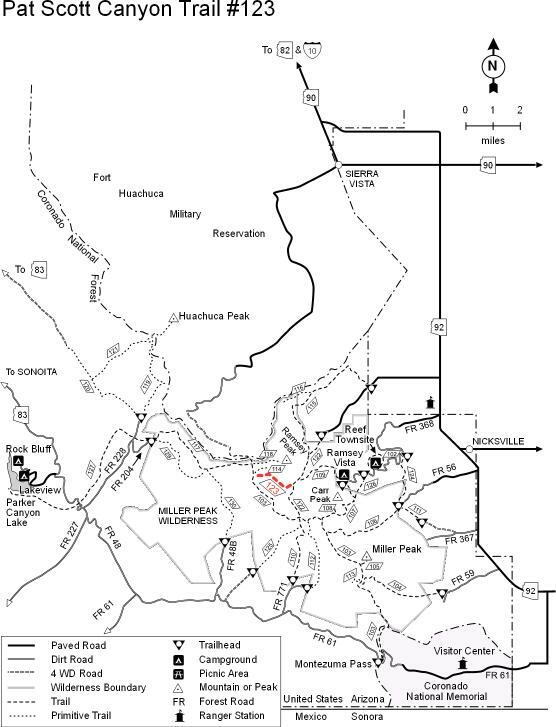 To get to the Hamburg Trail, drive 6 miles south of Sierra Vista on AZ Highway 92 to Ramsey Canyon Road. Follow Ramsey Canyon Road 3.5 miles to the Nature Conservancy's Ramsey Canyon Preserve parking area and trailhead. The parking area on private property here is frequently full, but reservations are available on weekends and holidays.